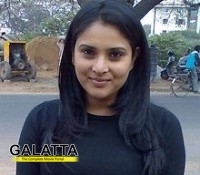 Polladavan actress, Divya Spandana aka Ramya who ventured into politics, by winning the the Lok Sabha polls for the Mandya constituency recently, has been hospitalised. The actress who was in Delhi after the elections, is said to have been admitted at the hospital, after a severe fever. Her spokesperson revealed that Ramya was quite busy for the last few days and did not take proper care of her health, hence she is down with viral fever and is hospitalised. It is also said that she would be discharged soon.